Professor Adrian Moore, 49, has been appointed Head of the School of Environmental Sciences at the University of Ulster's Coleraine campus. A specialist in Geographic Information Systems (GIS), the Armagh-born academic, now resident in Portstewart, has been at the forefront of the University’s expansion of GIS studies and its spin-out diversification into the multi-billion dollar global GIS industry. Educated at the Christian Brothers Grammar School in Armagh city, Professor Moore first entered the University of Ulster in 1981 as an undergraduate student in geography and continued his education there to both masters and doctoral level. He joined the staff of the University as a lecturer in GIS in 1993, became senior lecturer in 2000 and Professor of Geographic Information Science in 2006. He introduced GIS into the School teaching curriculum in 1994 and today, the University of Ulster, with 85 registered students on its Masters GIS programme, is the largest provider of postgraduate GIS education on the island of Ireland. Professor Moore was Managing Director of the University spin-out company Causeway Data Communications (CDC) Ltd, now trading as Geopii, from 2002 – 2010. The company has become one of the University’s most successful spin-out ventures. One of its most successful patented GIS mapping products is mass property valuation software used for local taxation estimation by local authorities in over 30 jurisdictions across the US. Returning to the university in 2010 following a period of secondment to the company,Professor Moorewas appointed Director of Academic Enterprise in the Faculty of Life and Health Sciences in 2011 and remains a director of Geopii. 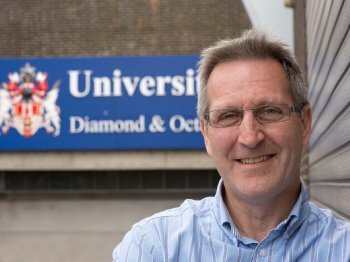 Professor Moore said: “I’m honoured and delighted that I have been chosen to head this dynamic and innovative School. My aim is to ensure that the School continues to deliver excellence in teaching and research, and to provide top-flight programmes of study at undergraduate and postgraduate level. A Chartered Geographer, Professor Moore is a Fellow of the Royal Geographical Society and also served as a director and national council member of the United Kingdom Association for Geographic Information (AGI) and Chair of AGI Northern Ireland. Professor Moore lives in Portstewart with his wife Aileen and their three children. In his leisure time he coaches the Eoghan Rua under-12 Gaelic football team in Coleraine and also enjoys a game of golf at Portstewart golf club. Photo caption: Professor Adrian Moore, who has been appointed Head of the School of Environmental Sciences at the University of Ulster's Coleraine campus. The School of Environmental Sciences is based at the University’s Coleraine campus. With over 350 full-time undergraduate students, 250 postgraduate students and 40 academic, technical and administrative staff, the School is one of the largest in Britain and Ireland. Particular strengths are the development of interdisciplinary taught and research programmes that integrate the environmental, earth and marine sciences with human geography and the use of spatial analysis to investigate relationships between environment and society. Teaching quality:Teaching in the School was rated as ‘excellent’ in the most recent Teaching Quality Assessment Exercise conducted by the HEFC and has consistently been included as one of the top ten of its kind in the UK in independent league tables published by national newspapers. We were also recently commended by the Quality Assurance Agency’s Institutional Audit for the quality of our teaching and management of the learning experience. Research quality:In the most recent Research Assessment Exercise (2008), 90% of our research was determined to be world leading, internationally excellent, or internationally recognised in terms of its originality, significance, and rigour.